Conventional histories of the battles of Mons and Le Cateau describe how, although the British were massively outnumbered, precise and rapid British rifle fire mowed down rows of German troops. The staggering German casualties made these battles British victories, and set the stage for the Battle of the Marne. Neither battle has ever been described in English from the German point of view. 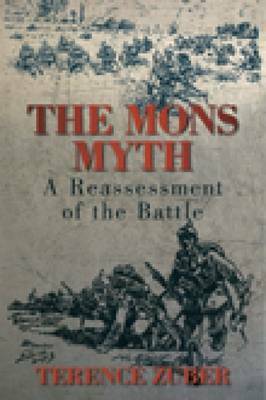 Using German tactics manuals and regimental histories, The Mons Myth describes the battles at Mons and Le Cateau. It also subjects British tactics to a critique that goes beyond admiration for rapid rifle fire and presents new and startling perspectives of both Mons and Le Cateau, showing how the Germans employed a high degree of tactical sophistication in conducting a combined-arms battle. The odds at both battles were, in fact, even, and German casualties never reached the levels described in the standard histories. The Mons Myth is the first history of these battles to take this approach in ninety years. Terence Zuber is a retired army officer with a PhD in history from the University of Wurzburg. Having commanded rifle and mortar platoons and a mechanised infantry company, he spent eight years conducting counter-intelligence operations against the Stasi. The author of Inventing the Schlieffen Plan, German War Planning 1891-1914, The Battle of the Frontiers and The Moltke Myth. Terence Zuber is a retired army officer with a PhD in history from the University of Wurzburg. Having commanded rifle and mortar platoons and a mechanised infantry company, he spent eight years conducting counter-intelligence operations against the Stasi. The author of Inventing the Schlieffen Plan, German War Planning 1891-1914, The Battle of the Frontiers and The Moltke Myth.